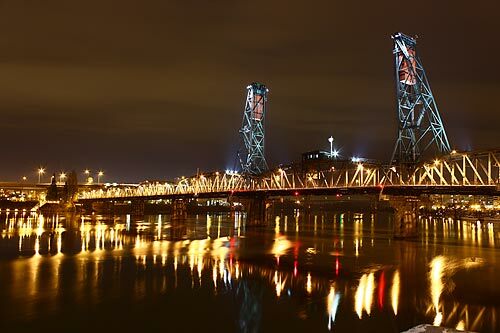 (Portland, Oregon) - At about 100 years old, Portland's Hawthorne Bridge is the oldest operating lift bridge in the U.S., and among the oldest in the world. It’s an icon for Portlanders these days, and a favorite for walks across the river during warmer days and seasons – though it’s heavily used every day by the cyclists who populate Portland in ever greater numbers. Widened sidewalks make among the best bridges in Portland for two-wheel commuters. It was finished in 1910 to replace another bridge that burned a few years earlier, and has since gone through only one massive renovation, which included changing the color scheme from yellow to its current orange and green. Connecting from Hawthorne Boulevard, the street and the bridge were named after Dr. J.C. Hawthorne, who among other things was partially behind the first incarnation of the Morrison bridge. The Hawthorne had a brief appearance in the 2003 film The Hunted, which included creating a fake MAX train on the bridge (since this mode of public transport does not actually exist on this span). The outer lanes of the bridge are steel grates, which is a bit alarming to drive on since you can see the river below. At night, the bridge is a bit of visual poetry, with lights reflecting on the water, spires of light shooting up into the sky and creating all sorts of interesting color schemes, and the brilliant skyline of downtown Portland or the east side (depending on your vantage point) in the background. 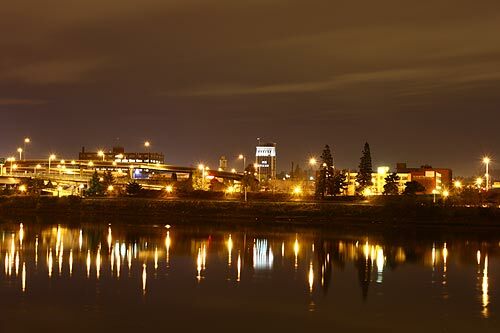 Below: Portland's east side of the river at night.